Overlooking beautiful Burntside Lake, this nostalgic home has a gentle slope to the crystal clear water. This home has all the modern conveniences with a full kitchen, laundry room, wood burning fireplace, open beams and a wall of windows in the living room facing the lake. The front deck is perfect for lake viewing. 3 Bedrooms: Main floor Master with king-size bed and three- quarter bath. Second and third bedrooms with double beds on the second level with full bath. Indoor and outdoor access to the second level. Enjoy the real feel of the northwoods when you soak in the wood burning sauna and take a dip off the swim ladder on the dock. Sauna house has a queen bed for extra guests with a refrigerator, microwave, and coffee pot. Half bath. 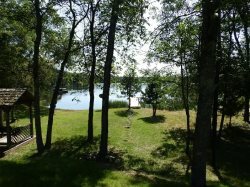 For larger groups, you may want to consider renting our Northwoods Escape cabin, which is within walking distance by shoreline. Well stocked kitchen with all appliances including microwave, coffee maker, toaster oven, dishwasher. Fully equipped with dinner ware and cookware. 10 miles from Ely on the East Arm of Burntside Lake, one of Ely's most scenic, studded with islands and ringed with coves and bays. Water sports abound her - canoeing, boating, skiing, and fishing. A deep water lake of over 7000 acres. Fishing on Burntside centers on lake trout which have been stocked here since 1912. Fishermen also enjoy nice populations of walleye, smallmouth bass and northern pike. All cabins rent Saturday to Saturday and are available by the week only. If you are looking for a longer stay or need a check-in on a different day, please contact our office to book your stay. Please be sure you have selected a Saturday check-in before booking online. Rates are based on 8 maximum guests. All cabins rent Saturday to Saturday and are available by the week only. Please be sure you have selected a Saturday check-in when booking online. If you are looking for a longer stay or need a check-in on a different day, please contact our office to book your stay.